I’m not a huge cocktail girl. Take me to the Caribbean and places where fresh pineapple and coconut trees grow and I could sip my weight in fruity drinks. But around here, they’re often just too sweet for me to crave more than a sip or two, fresh mint mojitos excluded. 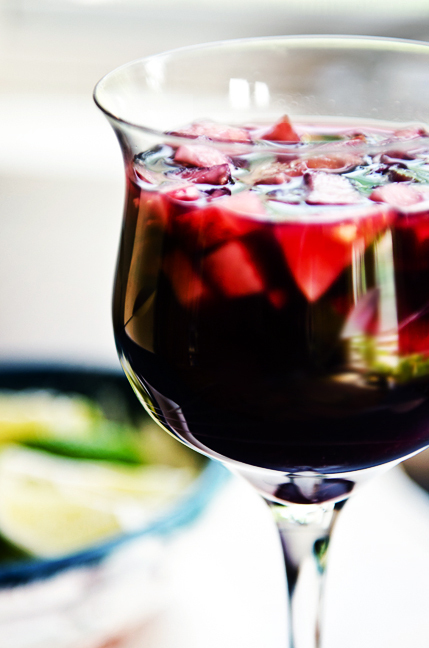 However, I’ve always been a fan of sangria, especially the red variety when it’s not on the overly sugary side. I love the summery feel of cold red wine, the only time I typically drink it chilled, and I especially love the wine-drunken fruit. The drink also just speaks of fun and immediately draws memories of leisure, so it’s always nice to serve at friendly gatherings. 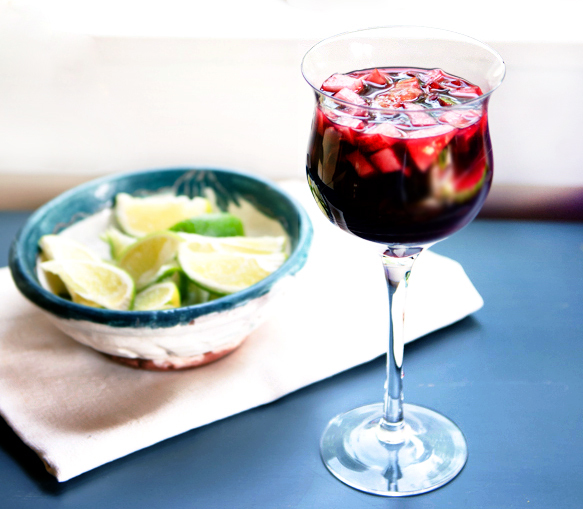 I won’t claim I’m a sangria expert, but I recently made this fairly simple version and it was a hit among all of my house guests that evening. I stuck with the classics – apples, oranges, limes – but feel free to experiment with adding any seasonal fruit. I really doubt you could go too wrong by throwing in some fresh berries to the mix. That thought alone leads me dreaming up a peach sangria. Looks like I might have to switch back from the dark side. Peach raspberry white wine sangria? Yes please. Though I won’t forget this recipe too. Whisk together sugar and orange juice. Add brandy, triple sec, and wine. Stir in fruit. I can’t wait to try this! I am not a sweet wine drinker either but would love to give this a try! Thanks for recipe!! Just found this on tastespotting! Looks delicious! Thanks for sharing.